Java quickly achieved his CFA Grand Premiere title, then it was on to learn the ropes in TICA. He flew threw the TICA title ranks to become a Supreme Grand Champion Alter accomplishing a NW Regional Win along the way. The next year he set his sites on an International Win requiring a ranking in the top 25 Alters Internationally for the 2009/2010 show season. He was also the Best Norwegian Forest Cat Alter 2010. The following year, with very limited showing, he brought home his 3rd leg for his Lifetime Achievement Award with another NW Regional Win . 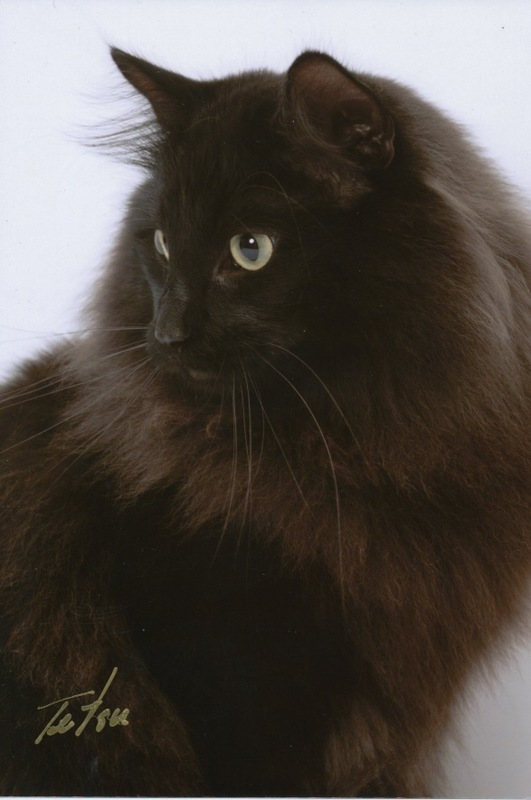 This is the first time a solid black Norwegian Forest Cat had achieved this award. Thanks to Karen Stinson for our very special boy! Sound Credits: Wedding Day at Troldhaugen by Edvard Grieg performed by the young Israeli Pianist Tal-Haim Samnon. Use the video controls below to adjust volume or turn off sound.